When I visited Paperquirks a few weeks ago, I picked up this Midori MD A5 grid notebook, and have been using it for the last few weeks. 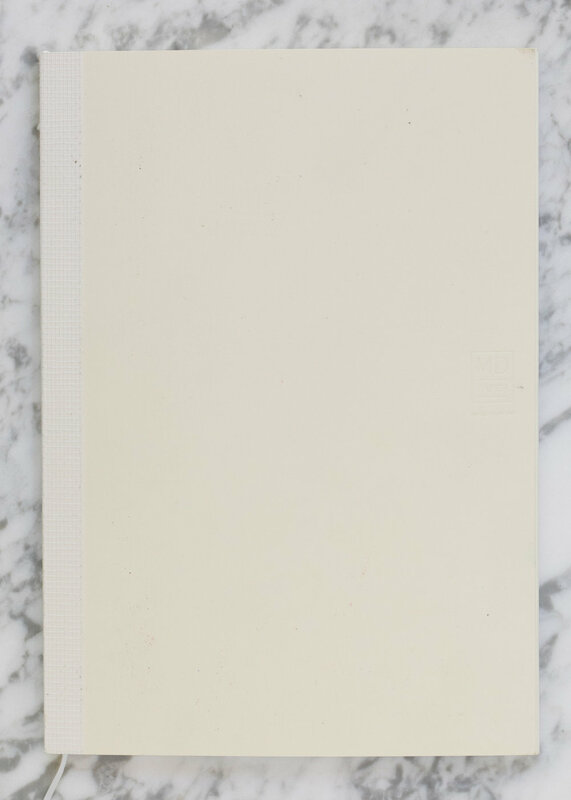 The notebook has 88 sheets (176 pages), and is a cream color. The paper measures 5.8" x 8.3". The grid is 5mm. There are little dots around the edges of the grid to help you count squares if you wish-this is helpful when drawing diagrams. This notebook also comes in blank and lined, as well as a few others from the 100th anniversary editions. The cover is a stiff cream paper with an exposed binding. They do sell covers separately. The binding is thread-stitched and lays completely flat. There is a bookmark, but I don't ever use bookmarks, I usually cut them out (I know, I'm a heathen). Paper color varies greatly from brand to brand, so I thought I'd do a quick comparison. Top to bottom, Midori MD, Rhodia Goalbook, Leuchtturm, ivory Tomoe River, copy paper, and Franklin-Christoph sugar cane paper. The Midori MD paper isn't quite as cream as the Rhodia Goalbook, but more cream than Leuchtturm. I tried a bunch of pencils and pens, as well as a couple of highlighters, and while there was some show through, nothing bled through or feathered. The paper handles fountain pens really well. No bleeding, average show through and no feathering. I was really impressed with how well it performed. I would feel comfortable using both sides of the page. The paper shows shading, sheen and shimmer well. Below you can see how Diamine Skull and Roses looks on ivory tomoe river (in front) and Midori MD (behind). The TR showed sheen just a little bit better, but not by much. I think after Tomoe River paper this might be my second favorite paper. Overall, I really like this paper. My only issue with this notebook is that the paper is cream, when I prefer white paper but I love everything else about it. I would definitely buy this notebook again. I do think it would be good to find a nice cover for it. Disclaimer: I purchased this product myself, and all photos and opinions are my own. There are no affiliate links on this page.